Over the past number of years, the Warrior Award has been given at each year's WWE Hall of Fame presentation to individuals who have battled tremendous obstacles. This year, however, the award will be given to a recipient that 2014 Hall of Famer Ultimate Warrior, who the award is named after, intended when he suggested it during his induction that year. "I want to thank the superstars that you never see... all the people behind the scenes here that work for WWE, some of them for years, 25, 30 years. They are the superstars that make this happen... The ring guys, who, back in the day would get to the building, set up the ring... and then come and ask me or the other guys “Can I get you anything?” [W]hen I think about the Hall of Fame and I think about honoring people that make this company work... I think that it would be appropriate to have a category in the Hall of Fame where you honor these people..." - Warrior, 2014 WWE Hall of Fame. Warrior would then go on to suggest the award be named after Jimmy Miranda, who, as Warrior described it, "was a guy who... used to drive his car or truck with a trailer, show up at the building, set up a table, and sell t-shirts and posters and pictures." The following year, with the approval of Warrior's wife, Dana, WWE created the Warrior Award. Instead of a WWE employee, they awarded it to the late Connor Michalek, a Pittsburgh boy diagnosed with cancer who made a deep impression on Superstars such as Daniel Bryan. WWE created the charity, Connor's Cure, to help combat pediatric cancer along with the Children's Hospital of Pittsburgh. Since then, the award has been given to other such recipients, such as former ABC News journalist and cancer survivor Joan Lunden and paralyzed college American Football player Eric LeGrand. This year, however, WWE is going with the best of both worlds with their pick. Their recipient for the 2019 Warrior Award will be WWE Head of Community Relations Sue Aitchison. 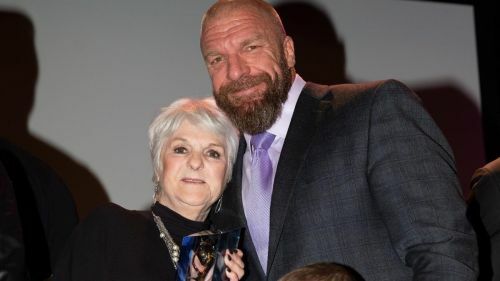 "A WWE employee for more than 30 years," read the official WWE statement, "Sue Aitchison is widely credited with spearheading WWE’s community outreach programs. [This includes] a long-term partnership with Make-A-Wish [and] WWE’s WrestleMania Reading Challenge."